America’s top intelligence official is reneging on a promise made under the Obama administration to estimate how many Americans have been spied on using a warrant-less surveillance law intended to target foreigners. The decision to abandon that commitment isn’t sitting well with civil liberties advocates who formed a coalition this week in protest. 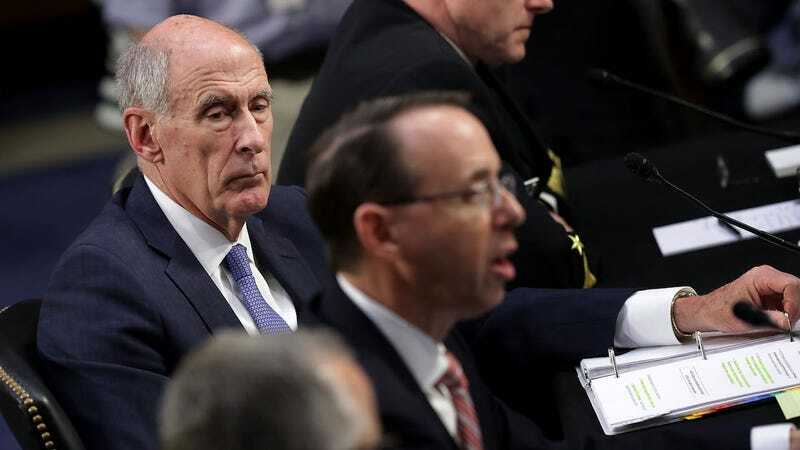 Director of National Intelligence Dan Coats told a Senate panel last week that it was “infeasible to generate an exact, accurate, meaningful, and responsive methodology” to show how many Americans have been spied on under Section 702 of the Foreign Intelligence Surveillance Act—the law which enables intelligence agencies to spy on the communications of foreigners with the help of American companies such as AT&T. Coats said the National Security Agency had already undergone a “Herculean” effort to determine the number, but somehow failed miserably. Given that the NSA claims to be the largest employer of mathematicians in the country (the exact number is classified), Coats’s explanation that counting is really hard seemed fairly absurd. One can only conclude that the number of Americans being spied on “incidentally” under 702 is so shockingly high that announcing it would endanger any chance of renewing 702's authority before it expires on January 1, 2018. Either way, the official President Trump appointed to lead the Intelligence Community seems to have thrown his hands in the air with regard to this simple accountability request. It’s astonishing, really, that the White House was able to find someone who is less inclined to be straightforward with the American public than James Clapper, the former director, whose New York Times obituary will undoubtedly contain an accusation of perjury. Late Monday, the American Civil Liberties Union—along with more than two dozen other digital and civil rights groups—signed a letter [PDF] criticizing Coats’ decision to leave the public “in the dark, and with justifiable and significant concerns about the effect of Section 702 surveillance on Americans’ privacy and civil liberties.” The letter was sent to Office of the Director of National Intelligence and then forwarded [PDF] to the chairman and ranking member of the House Judiciary Committee—Representatives Bob Goodlatte and John Conyers, respectively. “Members of Congress should be outraged that the NSA has reneged on its commitment to provide an estimate of the number of Americans that the NSA spies on under Section 702, and should use every tool at their disposal to demand that this information be provided,” Neema Singh Guliani, ACLU legislative counsel, said in a statement. Aside from the ACLU, 32 other groups signed on to the letter, including the Brennan Center for Justice, the Electronic Frontier Foundation, Demand Progress, and the Sunlight Foundation. The groups charge Coats’ with backtracking specifically for political reasons (as opposed to practical ones). “It is critical to allow the American people and their representatives to fully understand the impact Section 702 has on their privacy and civil liberties as Congress considers reauthorization of the law,” they said. Rep. Conyers did not immediately respond to a request for comment. An aide to Rep. Goodlatte referred questions to a Judiciary Committee spokesperson, who likewise did not return a request for comment.